Malignant Otitis Externa (MOE), a commonly observed severe infection of external auditory canal and skull base in diabetic patients pose a clinical challenge and warrants prompt treatment. 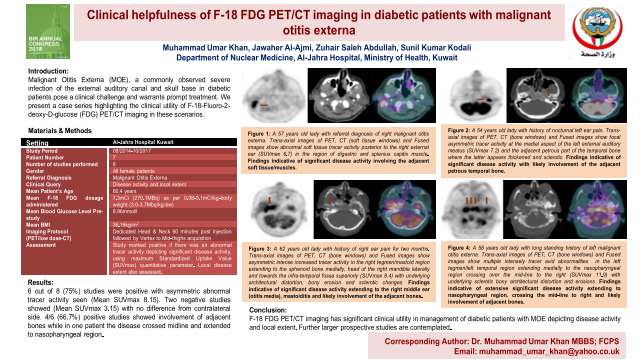 We present a case series highlighting the clinical utility of F-18-Fluoro-2-deoxy-D-glucose (FDG) PET/CT imaging in these scenarios. Eight PET/CT imaging studies were performed on seven female diabetic patients, referred to the department, Al-Jahra Hospital Kuwait consecutively from 08/2014-10/2017, with clinical diagnosis of MOE. Clinical query was to assess disease activity and extent. Patients were diagnosed after clinical history and local examination in outpatients department. Mean-age of patients was 60.4years. Mean-dosage of F-18 FDG administered was 7.3mCi (270.1MBq) according to weight-based protocol of 0.08-0.1mCi/kg body-weight (3.0-3.7Mbq/kg-bw). Patients mean blood sugar level was 8.96mmol/l and mean BMI 36.16kg/m2. Patients underwent dedicated head and neck PET/CT protocol 60 minutes post tracer injection followed by vertex to mid-thigh exam. Low-dose CT acquired for anatomical localization and attenuation correction. Study was marked positive if there was an abnormal tracer activity depicting significant disease activity, using maximum Standardized Uptake Value (SUVmax). Local disease extent was also assessed. 6 out of 8 (75%) studies were positive with asymmetric abnormal tracer activity seen (Mean SUVmax 8.15). Two negative studies showed (Mean SUVmax 3.15) with no difference from contralateral side. 4/6 (66.7%) positive studies showed involvement of adjacent bones while in one patient the disease crossed midline and extended to nasopharyngeal region.